Do you have a minute to spare to learn some English? 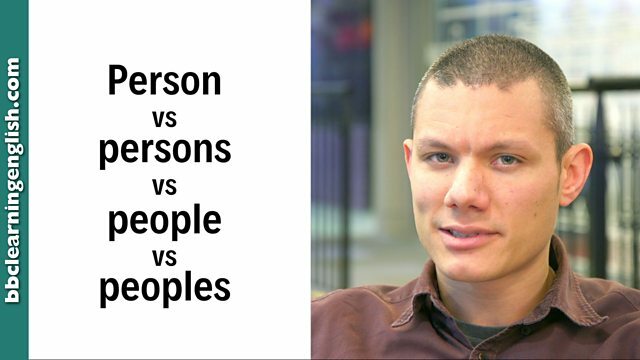 Here's Dan to tell you all about the difference between person, persons, people and peoples. Lucky you! Give us 60 seconds and we'll give you the English! Hi, I’m Dan from BBC Learning English and today I’m going to talk to you about person and persons, people and peoples. A person is a human man, woman, or child. It is a singular countable noun. There was one person at the door. The plural of person is people. It refers to a group or a number of human beings. It is a plural countable noun. There were three people at the door. Persons is a plural countable noun. It's similar to people, but it's considered more polite and more formal. It’s most often seen written down. This lift can hold a maximum of 15 persons. Peoples is the countable plural form of people and comes from the other meaning of people. People can mean nation. The Aztecs were a people that lived in the Americas. Or, there are many peoples living on the Earth. They are all human - so far. Person, persons, people and peoples. A person is a human man, woman, or child. It is a singular countable noun. There was one person at the door. When did you see this suspicious person? She's a very interesting person. You should talk to her. The plural of person is people. It refers to a group or a number of human beings. It is a plural countable noun. There were three people at the door. The people who live here are very rich. People can also mean nation. Peoples is the plural form of this meaning. Peoples means nations. The Aztecs were a people that lived in the Americas. The English are a strange people. There are many peoples living on the Earth. When the peoples of the Earth unite, we will have peace. Persons is a more formal, more polite form of people. It's a plural countable noun and is most often seen written down - such as on signs, in newspapers and in the context of the law. This lift can hold a maximum of 15 persons. The police expect to catch the persons responsible for the theft. My client has never seen these persons before and so he is innocent. Is this person talking about humans or nations? Are they talking about one or a group in general? Mum told me that I am rude to everybody and that I shouldn't talk to ______ that way. Is this informal or formal? "This reporter has learned that police are confident of catching the person or ______ involved." Are we talking about singular or plural? Do we mean a number of men, women and children or a nation? It is thought that if you go far back enough in time all the nations of the Earth evolved from one ______.